One of the many factors that have contributed to the massive expansion of solar energy over the last decade are solar incentive programs. Among the largest and most impactful of these incentives is the 30% federal solar investment tax credit, known more simply as the ITC. While there are other smaller incentives that help offset the costs of going solar, the ITC is easily the most lucrative, but it's about to start getting much smaller. 2019 marks the end of the current 30% rate. In 2020, the ITC begins ramping down as part of a two-year phase out. So, if you want the fastest and biggest return on your solar investment, this is the year to act, and given the demand on solar installers in this final 30% year, the sooner you start your solar project, the better. Below we cover important parts of the ITC and explain why acting now will give you the best return on your solar investment. First established as part of the Energy Policy Act of 2005, the solar ITC is a tax credit for 30% of the solar system cost (with no cap). This can be taken all in one year, or spread out over five years. To qualify for the ITC, you must have a tax liability and you must own the system—leased systems do not qualify. The incentive's original expiration date was extended twice, with the most recent extension taking place in 2016. 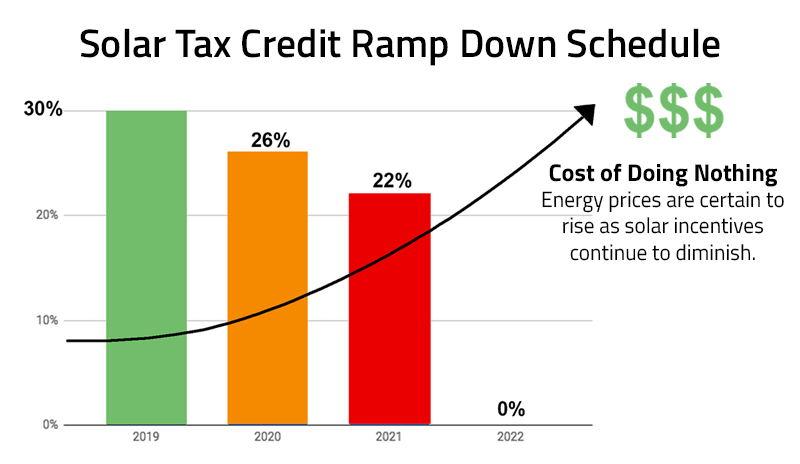 That extension detailed the current ramp down schedule that phases out the tax credit completely for homeowners by 2022. In our current political climate, it is unlikely that congress will offer another extension, so we encourage you to capitalize on the 30% rate now before it's gone. What is the ramp down schedule? The current 30% rate is in place through the end of 2019, so this is the last year to reap the maximum return from this lucrative incentive program! In 2020, the ITC reduces to 26% and then drops again to 22% in 2021. From 2022 onward, the residential ITC no longer exists, but the commercial ITC will remain at 10%. While the 26% rate still sounds pretty good, it actually has a sizable impact on the payback period, extending it by a factor of several years in some estimates. When it drops to 22% in 2021 the payback period will extend yet again. So, if you're inclined to turn Arizona's most abundant natural resource into immediate energy savings, we strongly recommend grabbing the 30% rate before while it's still here. How can I claim the 30% solar tax credit? To be eligible to claim the 30% tax credit, your solar energy system must be installed, fully paid for, and commissioned by your power utility in 2019. Only purchased systems apply. If you're leasing, the tax credit goes to the lease holder. To file your taxes claiming this incentive, you'll need to complete the IRS form 5695 - Residential Energy Credits. We strongly recommend speaking with an account to cover the intricacies of filing and claiming your 2019 solar tax credits to ensure you've completed it properly. We've only just started 2019, so it's natural to think you still have plenty of time. But going solar involves many steps as well as coordination with outside entities for permitting and commissioning. Plus, installers like Sun Valley Solar Solutions are already seeing tighter installation schedules than normal as people rush to make the 30% deadline. At Sun Valley Solar, we always say, "The best day to go solar is yesterday" and with each passing day, that hyperbole holds more and more truth. With the 30% ITC coming to an end, 2019 is surely the most important year for solar in more than a decade. Contact one of our qualified solar integrators to start your solar project today!